What do you think the unusual plumes on Mars are? Re: What do you think the unusual plumes on Mars are? I haven't hear of any volcanic activity or wind storms that could put a plume as high as this one. Has anyone thought of the possibility of a major impact be asteroid or ? A nuclear blast that wiped out cabal colony and to send a message to cabalist. "This jet of fire had become invisible about a quarter past twelve. He compared it to a colossal puff of flame suddenly and violently squirted out of the planet, "as flaming gases rushed out of a gun."" - Chapter 1.
dark wrote: A nuclear blast that wiped out cabal colony and to send a message to cabalist. Volcanic plumes. The height is reasonable given the thin Martian atmosphere. condense and freeze due to rapid expansion. It's too early to be the Cabal - we haven't found the Traveler yet. I suspect instead it's the Reaper invasion force gearing up for their overwhelming invasion of Earth. Where's Commander Shepard when you need him/her? I am actually surprised no one has suggested wormsign yet. Shame on you all. If it was meteorite impact or marsquakes (or even alien construction!) or the like, one of the probes on Mars should have recorded seismic activity. Has anyone checked that against the time the images were recorded? My guess is out gassing of probably water due to meteor impact. Water in our atmosphere would behave similarly if introdoced at 125,000 ft.
Has anyone found pictures of what the terrain looks like under the plume? Volcanic eruptions can be separated by many thousands of years. Whats more because of the low gravity on Mars it is thought that magma chambers below Martian volcanoes penetrate far more deeply than those on Earth and may be more powerful. On a geological timescale Mars cannot be considered volcanically dead. As for evidence of that, we are possibly looking at it! "Cryo" volcanism, what else ? That doesn't look like a plume, that looks like clouds. They aren't sticking out beyond the limb of the planet; they're visible beyond the terminator (the line between the lit and the unlit portions of the planet) above the unlit portion, which is dark. Because from that area the sun is right on the horizon, clouds just a few miles above the surface can be lit for hundreds of miles beyond the terminator. On a side note, a meteorite impact could cause such a cloud and it's persistance in a confined place would be perfectly normal considering Mars' thin atmosphere. At 200 kilometers, there could be no winds at all to disperse it. 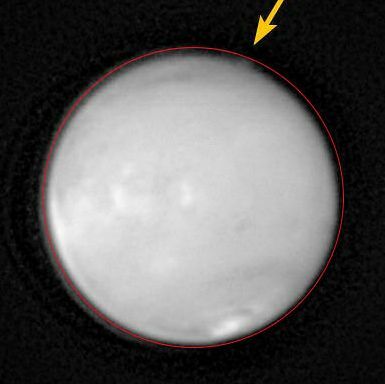 The first picture taken by Mariner 4 shows a similar plume above the limb. Experiments were made at JPL using a spare Mariner 4 spacecraft. I don't know if any explanation for the effect was associated with the spacecraft itself. The plume was estimated to have a height of 200K ft above the limb. Why, it's a coriolis storm, of course Be sure to keep an eye for any 'thopters flying out near the top! I don't think so, that picture was from 2012, and the plume lasted for days, not just the few minutes any kind of tornado would.